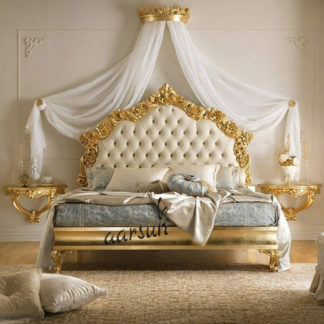 Aarsun woods brings to you strong quality of Wooden Bed that are designed using prime high quality wood. This Wooden bed is made from Teak wood. This furniture is perfect to complete the look of your home. These Handmade Wood beds are available in options such as Sheesham and Teak. You can also customize the size as well as finish of the bed to blend it as per your home decor. The Wooden Bed became the canvas for inspiring carvings and design interpretations in different upscale residences. For an exhilarating effect, choose an open Wooden bed to go with your large windows. This way the light can flow freely and flood every corner of the room without interruption. It is also highly comfortable, and will help you embrace slumber in the most organic way. It is available in single, queen and king size, and is made of highly durable wood. In fact, if you are not so sure of it in its present form, you can get it customized to suit your taste. The structure can be created out of Sheesham or Teak wood, and the finish can be selected out of a list that has options like natural, walnut and dark walnut. The rich solid wood texture adds a sophisticated look to your bedroom. The traditional and elegant carving design belonging to classic category reflects the vintage philosophy perfectly well. The head board is made straight for optimal support, while the base frame is made out of hardwood (teak) to ensure no sagging, shrinking, or swelling. The base cavity holds the mattress in place for composure and adequate rest. The block legs hold the top frame with their articulate strength without wobbling or shaking. 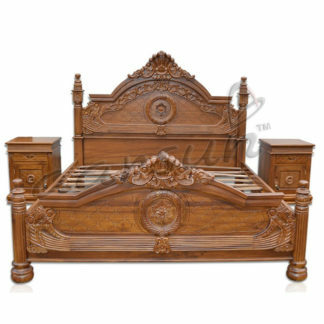 The Wooden bed designs have also been modified to suit everyone’s requirement. King size beds, queen size beds, single beds, double beds and so on are not the only Handcrafted from solid hardwood, with a simple, stylish design and classic Shaker influence that is evident in every detail of this beautiful bed, it’s no wonder this versatile bed has remained one of our customer favorites over the years. This bed can be made to fit any bedroom you choose, and with the classic wooden bed that sits above the headboard and footboard, this gorgeous bed is sure to have a presence to serve as the centerpiece to your entire suite.